This week on The Speakeasy, host Damon Boelte is joined in the studio by Germán González, one of the most celebrated working tequileros. Master Distiller Germán González is the great grandson of General Manuel González, former President of México between 1880 – 1884. In the late 1970s Germán’s father, Guillermo Gonzalez Diaz Lombardo, founder of La Gonzaleña, launched what would become the first ultra-premium tequila imported into the United States, Chinaco. 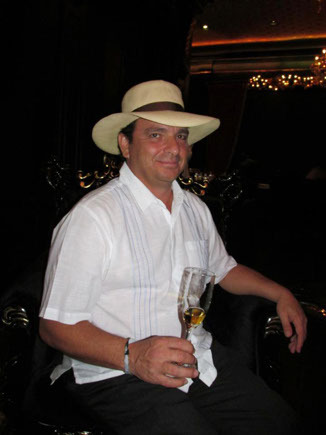 Germán worked closely with his father and learned how to handcraft tequila using traditional techniques. After years serving as Chinaco’s master distiller, Germán left the company to launch his own brand, like his father before him. T1 debuted at San Diego’s Spirits of Mexico Festival in 2009 to an outstanding reception from critics, aficionados, and industry experts. Germán soon expanded his T1 offerings to include four unique and highly-touted tequilas, which include two blancos, the Ultra Fino and Selecto, a reposado Excepcional, and an anejo Estelar. F. Paul Pacult’s Spirits Journal named T1 the #1 tequila of 2012.